The midbrain is one of the three divisions of the brainstem. It contains a long list of tracts, nuclei, and other structures that are all important to healthy brain function. In this video, I discuss some of the most prominent anatomical features of the midbrain along with some of their putative functions. Where is the inferior colliculus? INFERIOR COLLICULI AS SEEN WHEN LOOKING AT THE POSTERIOR SIDE OF THE BRAINSTEM. There are two inferior colliculi in the midbrain. They are symmetrically positioned, one on either side of the midline of the brainstem, and they form two bumps on the posterior surface of the brainstem just below the superior colliculi. The inferior colliculus is often subdivided into three regions: a central nucleus, dorsal cortex, and external cortex. The names of these last two regions are not completely consistent (e.g. some sources refer to the dorsal cortex as the pericentral nucleus and the external cortex as the lateral nucleus). The dorsal cortex and external cortex surround the central nucleus. What is the inferior colliculus and what does it do? The inferior colliculus is best known for its role in hearing. It is the largest nucleus of the auditory system in humans, and it is the point in the brainstem where all auditory pathways traveling through the brainstem converge. It is also the point from which auditory pathways branch out to carry auditory information on to other areas of the brain like the superior colliculus or thalamus. The central nucleus of the inferior colliculus receives information from a number of auditory regions, including the cochlea itself as well as other areas like the superior olivary nuclei. The central nucleus also extends neuronal fibers to the medial geniculate nucleus of the thalamus, another important nucleus in the auditory pathway. From there, information travels to the cerebral cortex. Thus, the inferior colliculus acts as an important relay station for auditory information. It's also thought, however, that the inferior colliculus plays important roles in integrating auditory information from various auditory nuclei, as well as in fine-tuning that information. The cells of the central nucleus of the inferior colliculus are organized tonotopically, meaning that different neurons respond preferentially to different frequencies of sound. Activation of neurons linked to a particular frequency, along with the inhibition of those that respond to different frequencies, may help to sharpen the perception of sound. Additionally, neurons in the inferior colliculus are specialized to respond to cues (e.g. intensity, the difference in arrival time of a sound to both ears, etc.) that allow for the localization of sound, or the determination of where in space sound is coming from. This information is transmitted to the superior colliculus, which is involved with movement (e.g. of the head and eyes) in response to visual and auditory cues in the environment. There are also direct connections between the inferior colliculus and cortical areas involved in the control of gaze, perhaps to facilitate complex tasks of gaze control that involve aspects of memory, recognition, and other more sophisticated types of cognition. These functions are all attributable to the central nucleus. The roles of the external and dorsal cortices are not as well understood. Although the external cortex receives input from auditory areas, it also receives information regarding bodily sensations, and is hypothesized to play a role in the representation of bodily position in respect to sounds in the environment. Damage to the dorsal cortex has been found to produce greater deficits in attention and vigilance than hearing, but its role is still in need of further clarification. Thus, more work needs to be done to completely understand the functions of the inferior colliculus, but at this point it is clear that the structure is an important component of the auditory pathway. It is involved in fine-tuning and integrating auditory sensations from a variety of other auditory regions, and sending that information on to the thalamus and cerebral cortex. It also is important to identifying the location of sound in space and orienting the body towards such sounds. Its other functions will likely become clearer with future research. Oertel D, Doupe AJ. 2000. The Auditory Central Nervous System. In: Kandel ER, Schwartz JH, Jessell TM, eds. Principles of Neural Science, 5th ed. New York: McGraw-Hill. Winer JA, Schreiner CH. 2005. The Central Auditory System: A Functional Analysis. In: Winer JA, Schreiner CH, eds. 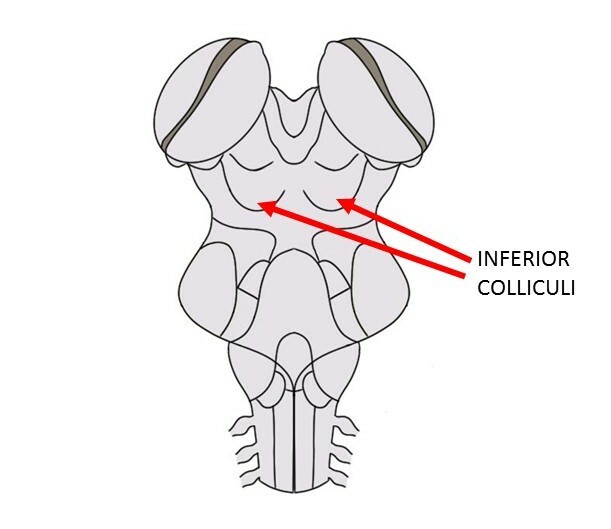 The Inferior Colliculus. New York: Springer Science + Business Media, Inc.